The factory is now fully installed, pending technical testing, which will then lead to processing of fruits. Dry tests at the Teso Fruit Factory in Soroti indicate it will finally be ready for launch before the end of this year. Trade Minister Amelia Kyambadde, members of the Board of Uganda Development Corporation (UDC), Leaders of Teso Region, farmers and other stakeholders toured the factory on Wednesday 16th May 2018 and were shown the various facilities in place. Officials told the visiting team that dry tests have been done with wet tests with actual fruits to start in June. After several delays, construction of the $12M about sh48bn Ugx factory has been completed with all machinery installed with official opening will be done by President Yoweri Museveni in August 2018. 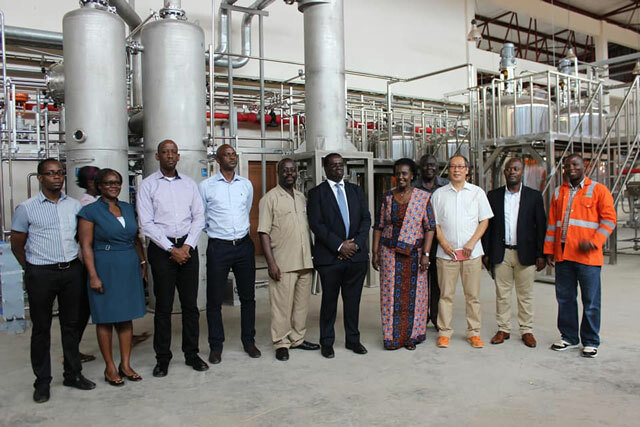 “After the trial test, commissioning of the factory will be done in August by President Museveni,” The Minister of Trade, Industry and Cooperative Amelia Kyambadde, told a group of stakeholders including fruit farmers, district leaders and MPs from the Teso sub-region during the tour of the factory last week. Kyambadde also said that as a ministry they have been restless over the issues regarding the fruit processing plant, pledging that she will not rest until the factory begins commercial production, which she said will happen in slightly over three months. According to UDC, government’s investment arm, the factory is now fully installed, pending technical testing, which will then lead to processing of fruits. The construction of the factory began in April 2015 and was scheduled to have been completed in 2016. “We should be up and running – start commercial production,” Yudaya Kadondi, the project coordinator, said after the tour of the plant. Ronald Kigongo Akakwanswa, the Soroti Fruit Factory manager production and technical services, said all arrangements have been made including organising farmers to supply the fruits. The fruit processing plant is an initiative of the government, with assistance of the Korea International Cooperation Agency (KOICA), working in partnership with the Teso Tropical Fruit Growers Cooperative Union(TTFGCU). According to Kadondi The factory has a capacity of 6 metric tonnes of oranges per hour, 2 metric tones of mangoes per hour and 4 metric tones of pineapples per hour, the plant will start with a single shift of about 8 hours, processing nearly 650,000 tonnes of oranges and 25,000 tonnes of mangoes annually. It will then move to a double shift and eventually to a 24 hour operation system in order to absorb supplies as well as meet market demand.